A fully matured head of wheat is exquisite to behold – pale gold in color with seeds neatly arranged in rows, each wrapped in their own protective sheath shaped like a droplet of water. Many varieties sport a "beard" with coarse whiskers that fan upward from each new grain like rays of light. When these heads are gathered together in a bunch, they make a very unique bouquet for decorating a table or mantle during the harvest season that will last throughout the year. Wheat is an ancient grain with uses ranging from bread to noodles to glue. Imagine the excitement when the first human discovered it. Perhaps she was in a large grassy meadow one summer evening and cut some of the tall golden grasses to make a bed for her night's rest. When she awoke the next morning, having tossed and turned on the fresh-cut stalks, she found some loose grains under her "pillow." As the sun rose on the horizon, she decided to put some in her mouth. And the rest is history. Wheat grows all over the world in every season. It doesn’t need much water – and it’s root system reaches as deep as thirty feet into the earth. 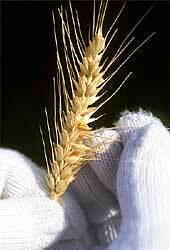 One grain of wheat can produce eight or more heads with over 40 seeds per head. And the grains harvested from one acre -- which is about the size of a football field – can provide a family of four with flour to make enough bread for ten years. 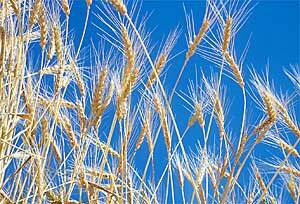 There are over 30,000 varieties of wheat – 150 commonly known-. One of the most widely used varieties is " hard red winter wheat". It is planted before the first Fall frost and usually harvested in late Spring. Hard red winter wheat is mostly used in making bread because it has a relatively high level of a protein called gluten which will produce a stretchy dough that will turn into a lighter, fluffier bread. To better understand the qualities of wheat and how it grows, we invite you to try the activities listed on the left.